SAN FRANCISCO--(BUSINESS WIRE)--Motivate International, the operator of the Bay Area’s regional bike share system, announced today it will add e-Bikes to its fleet, beginning with 250 e-Bikes in San Francisco this April. The pedal-assist e-Bikes, produced by Silicon Valley-based GenZe, will help riders by boosting their natural pedal power, so they can get up hills more easily and ride for longer distances. 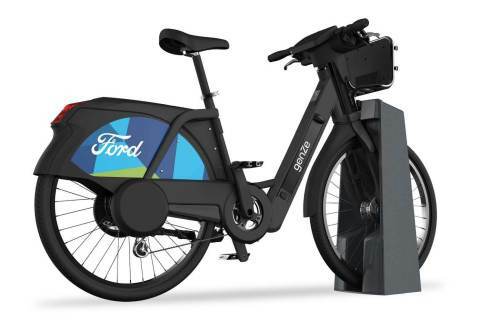 This new offering will integrate seamlessly with the Ford GoBike network and add a safe, reliable and affordable shared mobility option to the city. GenZe manufactures and assembles in Ann Arbor, Michigan with corporate headquarters in Silicon Valley. GenZe is a division of the globally-expanding $19 billion Mahindra Group, which focuses on enabling people to rise through new and better solutions to tomorrow’s challenges. The Mahindra Group is a worldwide leader in aerospace, automotive, utility vehicles, tractors, motorcycles, clean energy, and more. For more information on GenZe, visit www.genze.com.